On November 30, 2016, the Institute for Digital Arts & Humanities hosted the IDAH Annual Lecture with Marisa Parham. 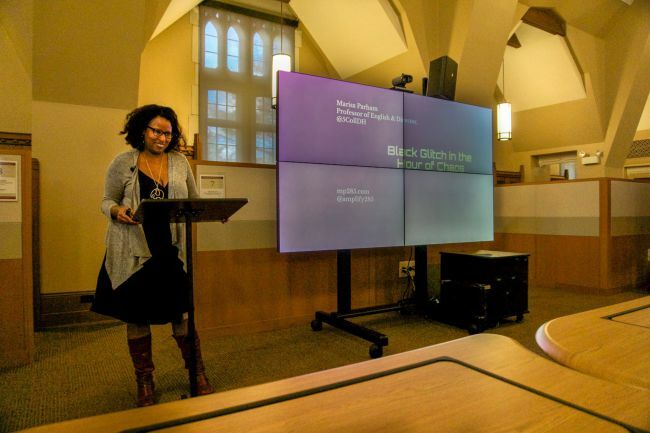 To an audience of students and faculty from across the university, Dr. Parham delivered the talk "Black Glitch in the Hour of Chaos." As part of IDAH's 2016-17 exploration of Diversity and Digital Culture, Parham's talk considered "how might we conceptualize 'the digital' as a kind of mediation that articulates the time and space of diasporic experience?" In answer, Parham' explored "rememory, affective excess, and glitch aesthetics in Toni Morrison’s Beloved, Hiro Murai’s video for Flying Lotus & Kendrick Lamar’s 'Never Catch Me,' and Zun Lee’s digital project, 'Fade Resistance.'" Parham is a Professor of English at Amherst College, as well as the Director of The Five College Digital Humanities Project. For more on her digital critical work, we recommend her interview in the LA Review of Books series "The Digital in the Humanities."